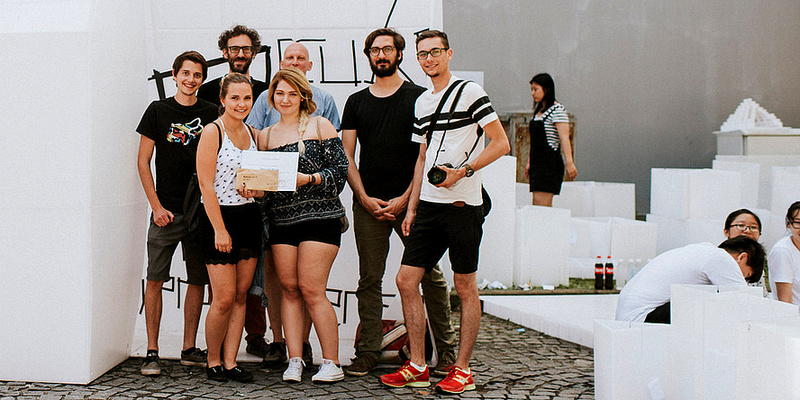 Five TU Graz students won second place with their project at Tongji University’s International Construction Festival 2017 in Shanghai. The TU Graz team in front of their “P-Cubed: ply-propylene”. The students came second place in Tongji University’s International Construction Festival 2017 in Shanghai. Front from left: Tobias Figlmüller, Desiree Wurnitsch, Angelika Lisa Mayr, Robert Anagnostopoulos and Johannes Kummer. They were supervised by Daniel Schürr (back left) and Wolfgang List (back centre). Meanwhile, the Faculty of Architecture of TU Graz was invited to participate at Tongji University’s International Construction Festival in Shanghai for the second time. This year some 60 teams – altogether 500 students – from more than 20 international and Chinese universities took part. The five TU Graz students had been chosen in an anonymous selection procedure at the Institute of Construction and Design Principles and were able to gain an outstanding second place in the concluding prize-giving ceremony. The theme of the construction festival was the design and construction of a pavilion for a micro community – a random group of people who would spontaneously like to spend the night. The pavilion had to be designed and built using the given building materials – 30 hollow polypropylene panels each of 180 x 180 x 0.5 centimetres – within four days. The aim of the Graz students was to connect private and public space. The simple form of a house with a gable roof is cut open and slightly offset to create various openings. The Graz team’s project “P-Cubed: ply-polypropylene” explores the topics of sustainability and a minimally roofed-over, weather-protected space. The pavilion exploited the maximum cubic volume in the design. At the same time, the students attempted to keep the waste material (offcuts) as low as possible. The aim of the planners was to create a space which connected both private and public realms. 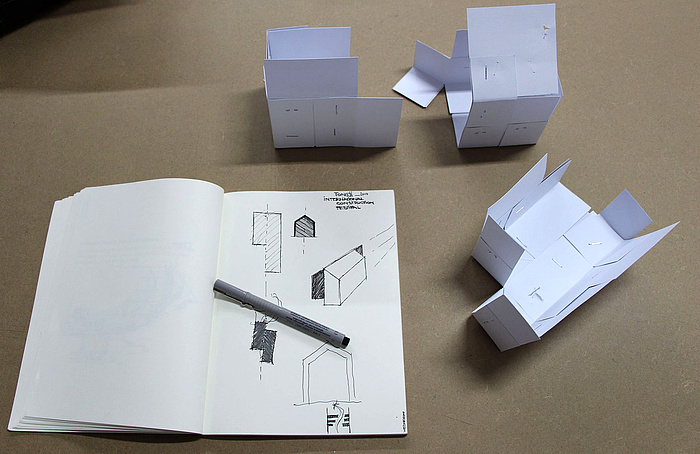 The simple form of a house with a gable roof was cut open by the students and offset to create various openings. 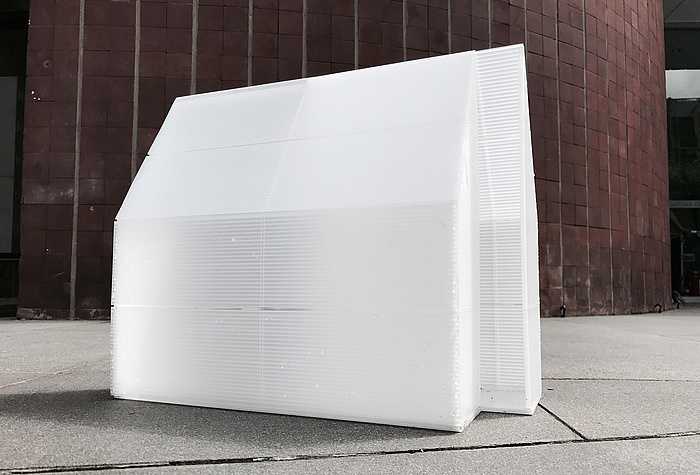 Photo of the model: The pavilion made of hollow polypropylene panels is weather proof and can be naturally transversely ventilated through the openings. During the day, the translucent material offers protection from direct sunlight; at night the pavilion becomes a luminous body. The construction consists of three layers of polypropylene panels, each of which runs in a different direction, like plywood. On top of this, the students offset the panels by half a panel to reinforce the construction and to increase material stability. The Institute of Construction and Design Principles (KOEN) was founded in 2013 and is led by Berlin architect Petra Petersson (Realarchitektur). The aim of the Institute is to familiarise students from the first semester onwards how closely the two main subjects of the architecture programme – construction and design – are intertwined.